As a responsible horse owner, it is always a priority to provide the best care possible to your animal at all stages of their life. The horse and rider relationship is a unique bond unlike many others. The horse-rider relationship is built on mutual respect. 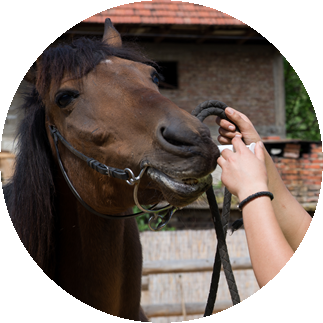 Your trusted equine companion relies on quality care, safety, and precautionary measures from you as their owner, and in return provides you with the same love and respect. Horses are large animals that require unique care for a variety of specialized health issues. Holistic care provides a safe alternative to many expensive, and often times, stressful means of health care. 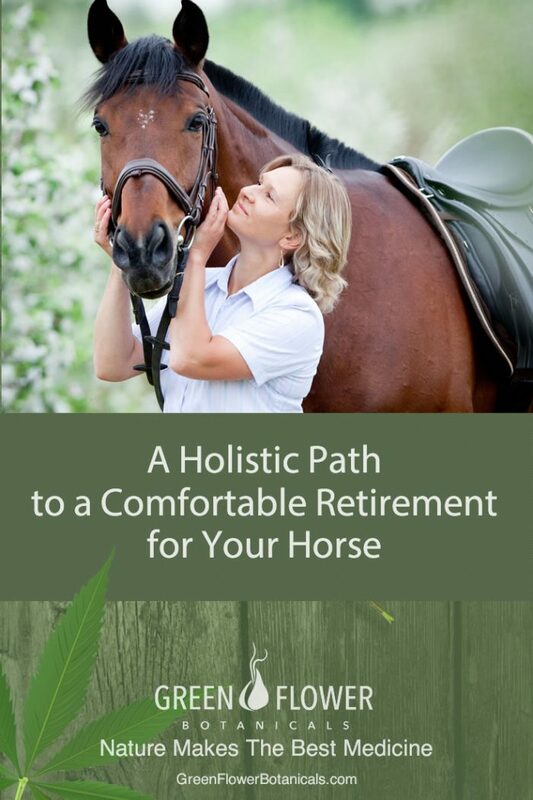 Whether your horse needs pain management for a short period of time while they recover from an injury, or a long term pain management solution throughout their golden retirement years in the pasture, holistic care options provide a safe and effective way to provide your horse the comfort and health they deserve. Throughout a horse’s life, they may face injury and pain for a variety of reasons. If you horse is showing signs of pain, it is important to address the root cause of the problem as soon as possible to prevent further injury. Because horses rely on equal weight distribution on all four of their limbs for daily activities, it is especially important to address health issues regarding pain to make sure a fixable problem does not quickly escalate into a life threatening problem. Below are a few reasons for both short and long term pain in horses. Horses in training, shows, and lesson programs are frequently asked to practice repetitive motions. These repetitive motions along with the additional weight of a rider can exacerbate wear and tear on joints and muscles causing pain. Horses are almost always at risk for an injury in some capacity. This may be due to uneven terrain, fighting or playing with other horses, or getting caught on wire, fencing materials, or brush in a pasture. Horses naturally have a fight or flight response to fear which could create potential situations for injury. A fear response could lead to a misstep during lessons or shows, injury while loading and unloading in a trailer, or a variety of other situations. Injuries are nearly impossible to avoid in some capacity but it is important to address these issues immediately. Joint inflammation in horses may be caused by injury, arthritis, and deterioration of soft tissues, cartilage, and bones. Phenylbuazone, more commonly known as bute, is a medication that is frequently used in horses to alleviate inflammation. Bute can cause many gastrointestinal side effects for horses, especially young and old horses. Long term use of this medication can cause ulcers and may also slow the process of bone healing by delaying the body’s production of cartilage in joints. 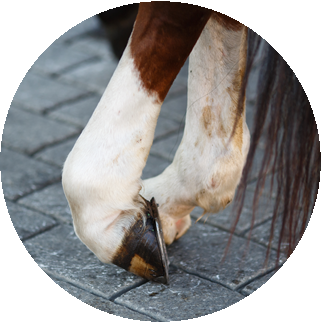 Injections are a common solution to block pain caused from arthritic joints in horses. This can be used for pain in joints, tendons, and ligaments. Occasionally, injections cause infection which further worsens the original problem of pain. Injections are an expensive solution to arthritis and have the potential to cause further damage to joints and cartilage. If a horse has a serious underlying problem, injections may be a temporary cover up while joints and cartilage are experiencing ongoing deterioration. Arthritis may also be caused by abnormal joint structures. When abnormal structures are subject to frequent or high impact use, this can create stress on unstable joints and lead to pain and arthritis. It is natural for animals face health issues as they begin to age. Some of these issues have a slow onset, while others may appear more rapidly. As horses begin to age, it is common to notice stiff joints and muscles. Aches and pains may have an impact on daily activities including standing, walking, and regular exercise. Your horse may show signs of limiting weight on a certain leg or joint, take longer periods of time to get warmed up for a ride, or lameness. While standalone occasions of lameness and certain amounts of deterioration of bone and joint health are normal as your horse ages, it is important to recognize signs that your horse is trying to communicate pain to you. If you notice signs of aches and pains in your horse, you can examine your horse for visible signs of inflammation, swelling, or discoloration. Horses may also express pain by pulling away or refusing physical touch in a painful area. Lunge lines and under saddle work may be observed to detect signs of pain and arthritis. If you are unsure what is causing your horse pain, seek veterinarian attention as soon as possible. Veterinarians may use radiographs to look for bone damage or changes in bone density, and ultrasounds, CT, or MRI scans to look for signs of soft tissue damage. Holistic equine care, including CBD oil, can provide an affordable solution for effective care for both short term and long term pain management in horses. CBD oil provides benefits for both pain management and day to day health. CBD oil can promote heathy absorption of fat soluble vitamins including omega 3 fatty acids that help to reduce inflammation and support overall joint health. CBD oil eliminates the gastrointestinal side effects of traditional inflammation medication and eliminates the chance of injection site infections. CBD oil may also reduce stress, limiting times of the fight or flight response that may lead to injury. It can help to curb boredom for horses that display behaviors such as cribbing in their stall. Because CBD oil can be administered orally or directly into feed, your horse will not be exposed to stressful or painful injections. CBD oil has the potential to limit behaviors that lead to injuries while promoting joint health and reducing inflammation and chronic pain. Cannabidiol, or CBD, is safe for use. Cannabidiol contains zero percent THC, which is the component that leaves users feeling intoxicated. Cannabidiol by itself is nontoxic and possesses anti-inflammatory properties that can help with overall horse health, especially for those facing pain and arthritis. Recommended dosages vary based on the weight, age, and severity of pain of your horse. It is important to be well informed about this product and consult with your veterinarian to provide proper dosing for your horse. The Stepwise dosing process is strongly recommended to provide a correct and effective dosage for your animal. From short term injury, to long term pain management care, CBD oil provides a safe solution for equine health care. You can feel confident providing a non-invasive, holistic care option for your beloved four-legged companion. Green Flower Botanicals provides CBD products with a variety of dosages to best fit your horse’s age, size, and pain management needs. The Equine CBD products provide a spectrum of cannabinoids, terpenes, and fatty acids derived from natural plants. The products are infused into a coconut medium-chain triglyceride to provide you with a high quality product that is pure and lab-tested. Each bottle contains a 30 day supply of product. CBD oil is a holistic approach to equine health care that can provide an affordable, long term, and safe solution for pain management needs. Provide your horse with the safety and comfort they need from their first days on the farm, through their golden years in the retirement pasture.